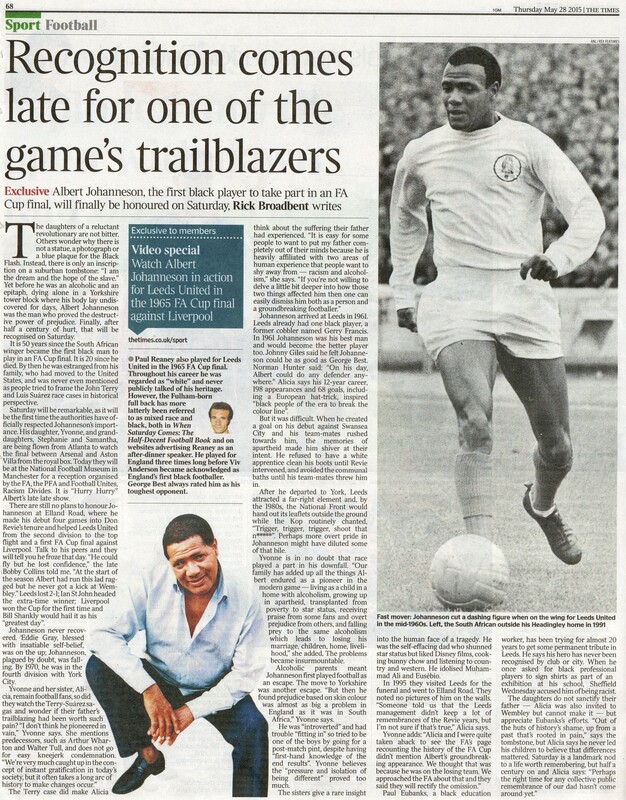 Apropos of nothing, here’s a piece from The Times recently on former Leeds player Albert Johanneson, the first black player to appear in an FA Cup final. Johanneson played in the Final for Leeds against Liverpool. His career is a rather sad tale of a quiet and introverted man unable to fulfill his potential through a combination of his background and the attitudes of the time. Johanneson’s career was over before I was old enough to know about him first hand, but I do remember his teammate Paul Reaney, who is also mentioned, and whose Leeds career lasted all the way to 1978. No disrespect to Albert, but as I remember Paul Reaney it’s the information about him that jumps out at me here. What never struck me at the time in my innocent youth was that Paul Reaney is clearly mixed race, though his background doesn’t seem to be well-known. Reaney, as mentioned here, played for England three times between 1968 and 1971, and can therefore claim to be the first ‘black’ full England international. Viv Anderson, who normally gets the credit for that, didn’t appear for England until a full decade after Reaney, in 1978. It’s easy to understand why Reaney played down his background at the time, given the grief that black players got. If I were him I think I might be shouting about it a bit more by now though – not that I’m judging him, what he says is entirely up to him. Still, either way it would actually make Albert Johanneson only the joint-first black player in an FA Cup Final. Arsenal Legends List – Even More Definitive Than Last Time! star player for Leeds Unted, and most of the football loving community became Leeds fans for that reason. We have wonderful memories of TYKEE which was a nickname we called him by in Germiston. Sorry, height of the apatheid era. It’s just co-incidence that one of the Germiston City club officials who hosted him on his return to South Africa visited me and left a few minutes before I stumbled upon your Article on Arsenal news( Arsenal, a team I am now a fan of). Thanks for the information Aziz. You want to condemn him to a life of misery? He deserves better.